The first Avengers movie was the first film to capture the scale and vibrancy of a comic book on screen. The sequel, Age of Ultron, marks a smaller but still significant advance: This is the first movie to make superheroes feel larger than normal people... by getting more personal. Here’s our spoiler-free review. And by spoiler-free, I mean that we might touch on the most basic plot points, as conveyed in the first teaser trailer, but nothing major. In a nutshell, this is a movie where Tony “Iron Man” Stark creates an artificial intelligence called Ultron which turns evil, and it takes all of his Avengers buddies to save the world. Writer-director Joss Whedon is the kind of magician who shows you exactly how he does a trick, but manages to make it even more impressive in the process. In this case, he constructs Avengers: Age of Ultron as a series of small, intimate relationship stories. And somehow, those small, interconnected stories wind up making the heroes feel amazingly big and significant. It’s not just the scale comparison thing, where seeing the characters in an intimate setting allows Whedon to put them up against an army of killer robots and make the latter seem bigger by comparison with the smaller — lots of action movies do that. The person-sized heroes aren’t just put against a huge backdrop — they become huge, in themselves. It’s something about the way Whedon constructs his big action sequences, like ballet performances (he loves his ballet). Building on the lovely, fluid action dioramas in the first Avengers, where the “camera” flows from one hero to the next, Age of Ultron has some beautifully constructed battle scenes, where all the heroes get to be awesome in turn. Unlike countless other CG-froth action hero movies, Age of Ultron manages to convey scale and wholesale destruction without dehumanizing its characters in the process. But it’s not just about the beautiful action scenes — Age of Ultron also manages to make its heroes seem huge and important, by making them seem like small, messed-up people. This is because Whedon understands that the power of superheroes is in their symbols. The core trio of Avengers — Iron Man, Captain America and Thor — each have symbols that are constantly held up and used as metaphors in the film. There’s Iron Man’s armor, Captain America’s shield, and Thor’s hammer. 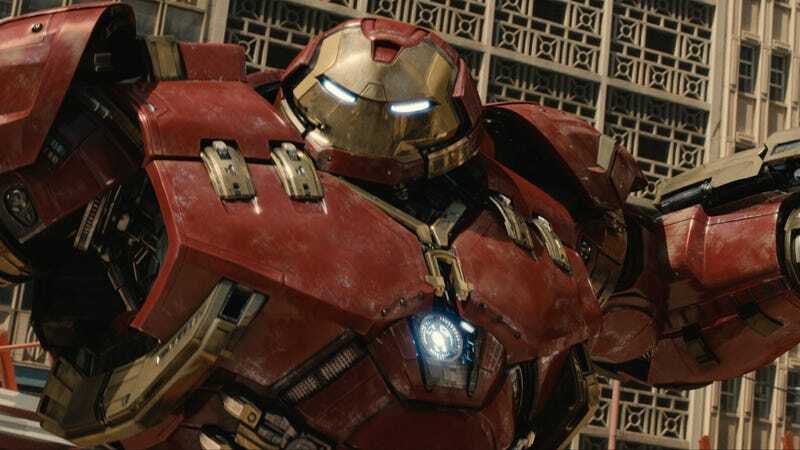 The preceding films in Marvel’s “Phase Two” series already experimented with divorcing the heroes from their symbols, by having Iron Man’s suits operate without him inside them, and by exploring what happens when someone else (the Winter Soldier) can catch Captain America’s shield. But now, in Age of Ultron, the notion of Iron Man’s suits operating without him inside them is taken to its furthest extreme. Ultron is the dark mirror of Iron Man, but also the worst case scenario for technology operating on its own. Meanwhile, as every trailer for this film has shown, the question of whether anyone else can lift Thor’s hammer is explicitly brought up. And Black Widow picks up Captain America’s shield almost as much as he does. This careful process of peeling the heroes apart from their symbols and showing how the symbols empower them winds up showing how the heroes are just people, but also how they get to become bigger. And meanwhile, the story of Ultron is really about an argument between Captain America and Iron Man about the nature of heroism (do heroes just keep fighting, or build an apparatus to keep the world safe and then call it a day? Their differing viewpoints are informed by what they saw in Captain America 2 and Iron Man 3) with Thor as the tie-breaker. The relationship among the core trio is the spine of the movie, and it allows Whedon to examine some weighty themes while also staying focused on characters. And meanwhile, most of the other characters in the film have one defining relationship, whose turning points are interwoven with the gyrations of the plot. I can’t really get into what those relationships are, without breaking the “spoiler-free” promise, but they’re mostly pretty well crafted and the sheer number and intensity of them goes a long way towards making this movie feel “epic.” A regular adventure can involve a few relationships, but once there are half a dozen pairings that you frantically want to see work out, the story pretty much becomes epic by default — this was the secret of Whedon’s Firefly, and he deploys it to great effect here. And the new characters in the film mostly manage to add to its strong focus on personal struggles — in particular, Scarlet Witch has the power to make people see their biggest fears, which winds up being a huge part of exploring how fear and insecurity drives these people. And how these things can make people both weaker and more powerful, depending on how they respond. That said, Avengers: Age of Ultron is not quite as satisfying a film as the first Avengers, because it’s radically overstuffed. There are too many forced links to other properties, including Marvel’s TV shows and all the movies. Some characters pop up towards the end of the movie that I forgot were even in this film. You half expect Daredevil to pop up drinking a latte. I have a feeling that Whedon’s three-hour-plus “director’s cut” will be a much stronger film, because some crucial connective tissue appears to have been cut for running time. Ultron feels like almost as much of a game-changer for the genre as the first Avengers, because of the way its heroes manage to be human-sized and massive at the same time. If Whedon’s first Avengers achieved the seemingly impossible task of getting Jack Kirby’s artwork on the big screen, then his second movie does something nearly as impressive: capturing the wholesale grandeur of Alex Ross or John Romita.